THE VICAR OF St Michan’s Church in Dublin has thanked gardaí for retrieving the stolen head of an 800-year-old mummy, but has said that he fears that it may be badly damaged. Gardaí confirmed yesterday that they had recovered the head of an 800-year-old mummy known as ‘The Crusader’ after it was stolen from the crypts of St. Michan’s Church last week. Speaking today on Morning Ireland, the Vicar of the Christ Church Cathedral Group of Parishes, of which St Michan’s is part, Archdeacon David Pierpoint, thanked the gardaí for recovering the head and the public for their support. He said he was called by gardaí “just after lunch” yesterday to inform him that they had recovered the head. “Just after lunch I received a phone call from the gardaí in the Bridewell to say that they had received a tip-off and they had recovered the head and the skull which were wrapped up and they brought them back to the Bridewell,” Pierpoint said. “I immediately went down to the station and examined the skull and the head. “Unfortunately they were quite saturated and damp and wet, so they’ve gone to the museum now to begin the process of trying to dry them out. But my fear is once they start drying out they just begin to crumble. He said the church would “have to wait and see” and then they would “possibly have to re-coffin and re-intern them in the vaults”. 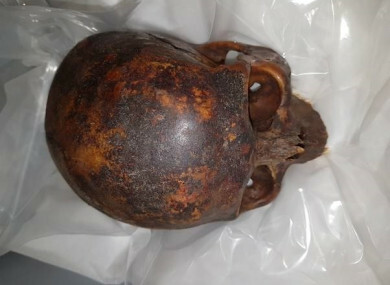 Pierpoint said that the skull of the Crusader had been “completely severed from the neck, the spine” and that it was “very unlikely that it could be reattached”. “It’s very unlikely that it could be re-attached as such, but it could certainly be laid back in its proper place,” he said. But whether it can ever be on view to the public again is something that we’ll wait until the expert findings… We’re in their hands now. Pierpoint said he didn’t know where the skull had been discovered, as it was forming part of the garda investigation. Email “Church thanks public for support after stolen head of 800-year-old mummy recovered by gardaí”. Feedback on “Church thanks public for support after stolen head of 800-year-old mummy recovered by gardaí”.